Guests tour the new building, which delivers innovative technology and more space in a central location for the Palomar College Police Department. Pictured above, left to right: Palomar College Governing Board Vice President Dr. John Halcón; Board President Mark Evilsizer; Superintendent/President Dr. Joi Lin Blake; and Trustee Norma Miyamoto. 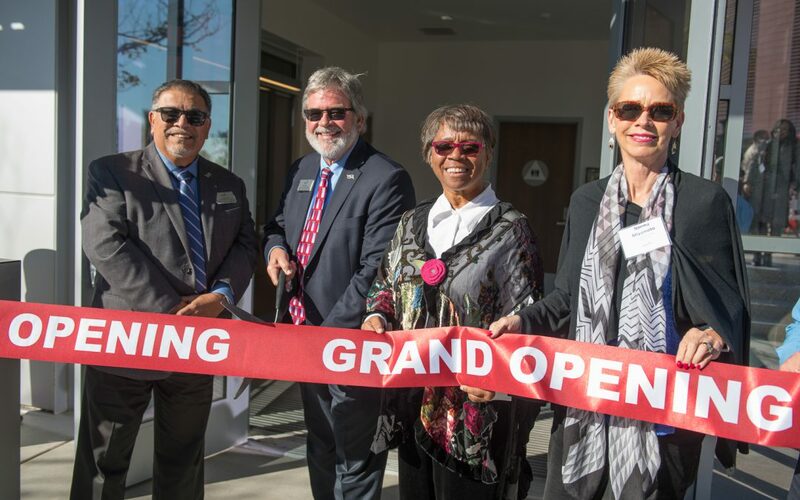 SAN MARCOS, CA ― Officials and guests of Palomar College gathered on Wednesday, Jan. 23, 2019 to celebrate the opening of a new Police Building at the college’s main campus. With 7,640 square feet of space, the building represents a long-awaited expansion for the Palomar College Police Department, which was previously located off Parking Lot 1 by Mission Road and is now situated in the heart of the campus.